There’s more, of course, but that’s enough for you to get the idea. Given the importance of email marketing for most businesses, GetResponse could be a very good tool to have. However, it’s also just one of many in this particular class of marketing utilities. Its competitors include such well-known options as MailChimp and Aweber. Against those, can GetResponse supply sufficiently attractive services for you to choose it instead of the others? We’ll try to answer that question here, at least based on our experiences. Before anything else, though, let’s talk a bit about what GetResponse is like first. First things first, because it’s usually what everyone wants to know: GetResponse isn’t free. It is available for a full-featured free trial, though, which you can use for 30 days. Unlike most free trials, it doesn’t require you to use your credit card details at all. That’s something most people will welcome, as it makes it less likely that they’ll be mistakenly charged for something later. Like its competitors, GetResponse offers plans that are priced based on subscriber count. If you need it to accommodate up to 1,000 subscribers, for example, you can go with its cheapest plan. That will cost you $15 a month. The pricing goes up as the subscriber count increases. Several tiers in the pricing plan above the $15 option is a $145 one, for example. This would allow you up 10,001 to 25,000 subscribers. In all, GetResponse has 7 plans, which isn’t a bad spread. To be clear, whether you choose the cheapest plan or the most expensive one, all of the features are the same. It’s a matter of capacity, is all. Now, like all email marketing tools, GetResponse has a function for importing email lists. That is, you can use it to build your email lists (it has a form creator for that purpose, in fact), but you can also transfer existing ones into it. You can enter the data one by one or even copy-paste into it, but you can also import via list files. Once you’ve done that, you can actually begin creating emails to send to them, and the tool gives you both a WYSIWYG editor and an HTML editor for that purpose. The WYSIWYG editor comes with around 500 templates that you can customize via drag and drop functionality. Templates are responsive, so they get customized based on details on record for each recipient. Advanced users will prefer to use the HTML editor. Both editors are supported by more than 1,000 high-quality photos from iStock. Worth noting here is that GetResponse comes with a landing page creator by default. The only way to really take advantage of all it can do is to pay another $15 for it, though. This add-on works nicely, for what it’s worth, although those already paying for dedicated landing page and form creator apps may hold off on it. Finally, GetResponse helps you evaluate your email marketing efforts by tracking various metrics, including the number of persons who open your emails, the number who actually click on the links you included in the emails, the number who unsubscribe, and more. It offers in-depth reporting for your efforts, third-party service integrations with over 90 sites (including WordPress, PayPal, Google Checkout, and more via Zapier), and contact segmenting. Easy list importing – Even compared to many of its competitors, GetResponse does quite well here. It also supports the following file types if you want to import lists in file form: TXT, XLS, XLSX, ODS, VCF, and CSV. Robust multivariate testing features – You can do A/B tests for your emails here—in fact, you can do A/B/C/D/E tests for them. GetResponse supports 5-variant testing, whereas most of its competitors only support 2-variant tests. Easy contact segmenting – There are some very nice, easily accessed options on GetResponse that have to do with its contact segmentation feature. As an example, it’s very simple to segment your last campaign (that means “list of email recipients/subscribers” in GetResponse’s lingo) and separate the ones who didn’t click on your link so that they can be added to a segment that will receive a different variant of your newsletter. Inbox and mobile previewing – Both of these work beautifully. A single click basically lets you see what the email will look like in your recipients’ inboxes (different email service providers’ views are shown) or what it will look like on mobile. Responsive templates – Yes, a lot of its competitors have this now. But GetResponse was still among the first to do it, and it shows, to some extent. Pricing – Are there cheaper email marketing tools than GetResponse? Yes. But do those tools have its features? Hardly! For its power and quality, GetResponse is actually very competitively priced. Its true competitors—in the sense of them having sufficient functionalities to rival it—generally cost more than it does. Aweber’s cheapest plan costs $19 a month for up to 500 subscribers, for instance. Compare that to GetResponse’s $15 for 1,000. GetResponse also gives you a discount of up to 18% if you pay the fees in one lump sum for the year. Calendar-like scheduling system – It’s clean and easy to understand, so you don’t spend forever trying to get it to work for you. UPDATE: A TON of new updates and new features that help you take your list building and automation further! WYSIWYG email editor is occasionally wonky – It’s probably inevitable with a lot of these drag and drop editors. You can get some good work done fairly quickly if you don’t customize it too much, but like Canva’s drag and drop editor, it has some bad-tempered days every now and then. Could be easier to upload your own HTML template – This probably won’t be an issue for most, since not everyone knows or wants to work with HTML, but it’s something that the more advanced users will talk about. No refunds – It’s in their terms and conditions. Whether you simply decide to stop using the service after paying or your account gets terminated due to some breach (e.g. for going over spam limits), you’ll have to fight a battle to get your money back. 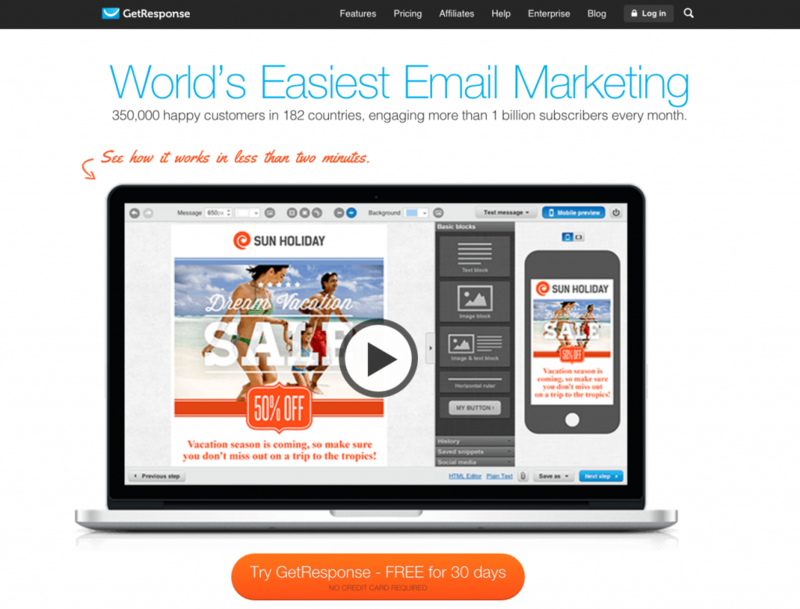 For the money, GetResponse is one of the better email marketing utilities you can get. The fact that there are 7 points in the “What We Like” section against the 3 in the “What We Don’t Like” one says a lot. It’s powerful, supports scalability, and rather user-friendly. That said, the sticking points can still make the tool unsuitable for your needs. You may also be the sort of businessman who prefers not to do the marketing yourself, in which case the choice of email marketing tool is up to the one you assign to take care of it. The easiest way to figure out whether or not you should get it is to give it a try. It’s free for a month and doesn’t even force you to submit credit card details, after all. That’s a generous offer as far as these utilities go, so there’s no point in not taking advantage of it.